Very unique and affordable luxury lodge on Makgadigadi Pans at Gweta in Botswana. Planet Baobab isn’t a new planet in our solar system – it must be one of the most original places you can stay at if you are visiting the Makgadikgadi Pans. This series of pans are the remains of what used to be a huge ancient inland ocean. If you are looking for more to see, the open-air courthouse in Gweta Town is very interesting. Also try the local traditional sorghum beer. As benefits an area such as the Makgadikgadi with its ancient geological history, the vicinity of Planet Baobab contains many stone tools from prehistoric eras. The well-known Fossil Pan also contains many fossil remnants. Why not try something different? If you are on your way to the Makgadikgadi Pans in Botswana, make Planet Baobab near Gweta Town part of your itinerary. 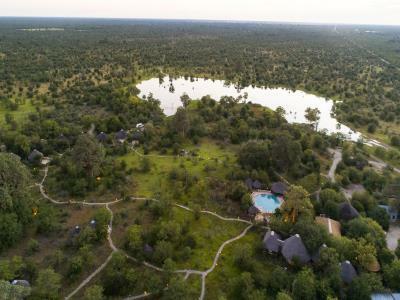 The fun lodge that is Planet Baobab is situated on the Ntwetwe Pan’s edge, on the Maun–Francistown road near Gweta Town, in Botswana. The accommodation at Planet Baobab is truly original, reflecting the traditional building methods of the original inhabitants of the Makgadikgadi Salt Pans in Botswana. You can choose between a traditional Bakalanga hut, built from mud, and a traditional grass hut, made in the way the Bushmen used to. Because both these types of huts at Planet Baobab are made from natural materials indigenous to the Makgadikgadi area in Botswana, they are perfectly temperature-controlled without the need for air-conditioners. 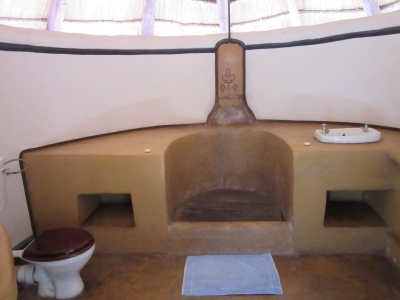 The Bakalanga mud huts are en suite and equipped with linen. 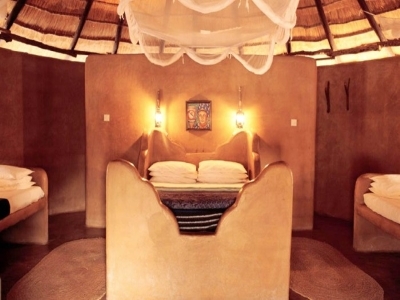 The interiors of these huts reflect what Planet Baobab is about: true creativity. The walls are smeared with cow-dung in traditional Botswana style, and adorned with art made with natural pigments found in the many termite mounds in the area. The traditional grass huts at Planet Baobab are constructed in the manner used by the first inhabitants of the Makgadikgadi – the Bushmen of Botswana. These huts are not en suite, but you are guaranteed a very comfortable night’ sleep on two single traditional mopane and cow hide beds. If you need the comforting presence of light the paraffin lamp will be welcome. If you want to sleep in your own tent, Planet Baobab has lovely shaded camping sites, each with braai area and shared ablution blocks. Planet Baobab’s Kalahari Surf Club adds a new dimension to surfing. 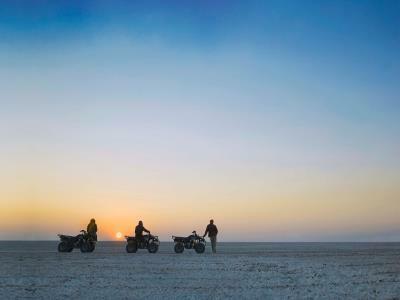 You won’t find 10-foot waves in this club on the Makgadikgadi Pans, only wide open spaces and quad bikes for the thrill of your life. After this, enjoy the magical sunset of Botswana before tucking into a braai in the moonlight. When you can’t keep your eyes open, go to sleep in a traditional bedroll while the African stars keep watch. This is magic! The shebeen at Planet Baobab reflects the essence of traditional African hospitality. Listen to the adventure stories of other guests while you relax in a cowhide recliner or traditional kgotla chair – ice-cold beer in hand. The enormous chandeliers, crafted from beer bottles, are quite something to see. Versailles meets Botswana! Listen to the sounds of the Makgadikgadi while enjoying your evening meal next to the campfire or beneath the giant marula tree. Woodlands Stop is just 300 km from Planet Boabab and very near the southern edge of the Makgadigadi pans if you would like to take a restful drive through Botswana and not rush. This lodge offers self-catering (self-contained) accommodation and camping near Francistown. Cresta Lodge is our preferred hotel in Gaborone, the capital city of Botswana, if you are travelling up from the south to get to the Makgadikgadi. It is about 8 hours drive to Planet Boabab. 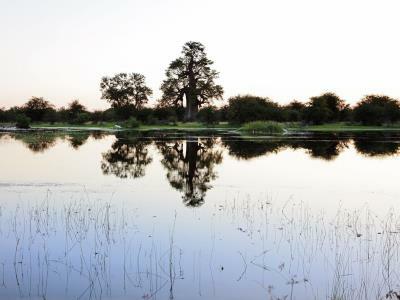 Maun is two hour's drive from Planet Boabab and the obvious next stop on your safari. You can select hotels such as Maun Lodge and Island safari Lodge or Thamalakane River lodge which is a new luxury lodge. Maun is a bustling, busy little town and a good place to stock up. If you should decide to rather go north, Toro Lodge and the Chobe Game Reserve is 400 km from Planet Boabab. Alternatively, if your safari started in Maun you can make the next stop the Makgadigadi Pans and Planet Baobab, before visiting Chobe Game Reserve. Accommodation in the Chobe region includes The Big 5 Chobe (Toro) Lodge, Chobe Safari Lodge and Mowana Safari Lodge or if you prefer to stay in self-catering accommodation Senyati Safari Camp is a good option. Zimbawe is to the east of the Makgadigadi Pans and many destinations in this country are within easy reach of Planet Baobab. Drive west to Nata and then North to Pandamatenga border post. From here it is about an hour's drive to Hwange National Park in Zimbabwe. Sikumi Tree Lodge is in the Hwange National Park in Zimbabwe. You can leave Planet Boabab early and be there at lunch time. From Hwange it will take you only two hours to Victoria Falls. A'Zambezi River Lodge is the only hotel on the banks of the Zambezi River and our preferred hotel at Victoria Falls. From there you could head south and see more of Zimbabwe. South Africa is a big country and Planet Baobab are proudly associated with numerous hotels. The Hole in the Wall Hotel on the Wildcoast is recommend for its beautiful views. Hakuna Mutata Guesthouse in Koffiefontein in the Free State is a guest house and the best accommodation in this town which is about 1000 km from the Makgadigadi Pans. Even so, if you are travelling up from the Cape it is a good place to stay over. If you plan to visit Cape Town after your Makgadigadi Pans safari, Upington Accommodation is halfway between Planet Boabab and Cape Town and you will find various options of accommodation there. 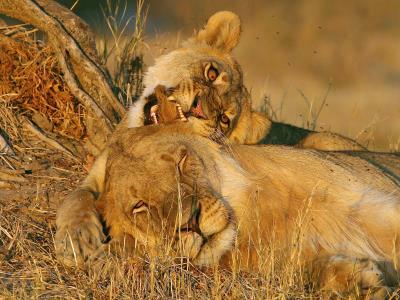 If you want to visit Kruger National park visit Kruger Park Safaris. They will tailor-make a safari to suit your needs. Open vehicle safaris are their speciality and you can find all you need to know about them by going to Temba's Kruger National Park page and seeing what is available.